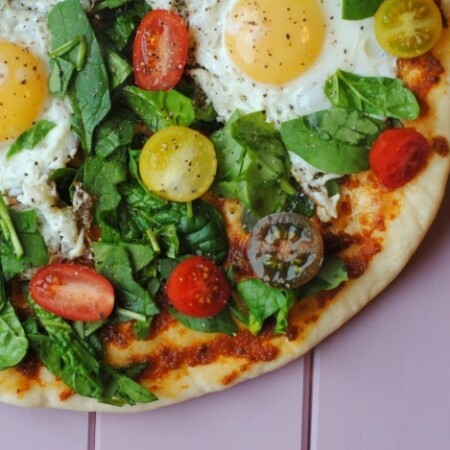 Who says that you can’t have pizza for breakfast? This Spinach and Tomato Breakfast Flatbread will feel like eating pizza, but it’s still packed full of protein with a vegetable boost too. Now, that’s the best way to start the day! Did everyone have a good weekend? Sorry to everyone in the UK, as I think I tempted fate with all the BBQ recipes last week, as the weekend was a wash out. We binge watched The Good Wife (if anyone else obsessed with that show) and finished our holiday clothes shopping. 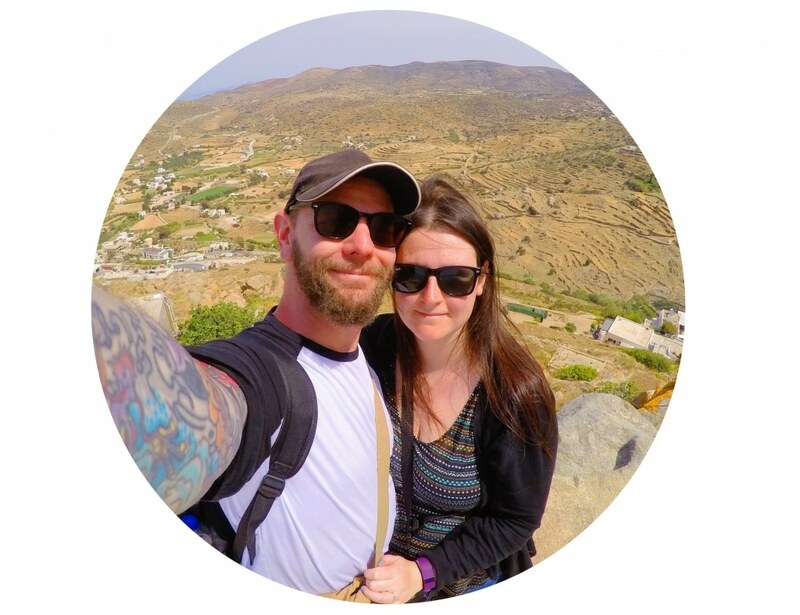 Eeee, only 6 days to go until our Greek adventure! This recipe has actually been a long time in the making and was inspired by something that we ate for breakfast in Rome 2 years ago for my 30th birthday. It wasn’t means as a breakfast item, but we ate pizza about 3 times a day on that trip. No judgement! When in Rome and all that! I thought that idea of egg on a pizza was genius, so this is my lighter, cheeseless version. Cheeseless? What?! I know, that isn’t what you have come to expect from me, but I have made this flatbread with cheese and without cheese and I preferred with without. Crazy, right?! I just found the cheese weighed it down a bit and was too over powering. So, let’s have a bit of cheese detox today and enjoy this without. Deal? If I have managed to eat some leafy greens before I am even out of my pyjamas, then I pretty much feel like I have my shizz together and to be honest, I feel pretty smug. So, when the 11am chocolate cookies cravings hit, I can justify them. I joke. Kind of. But seriously, I am really making the effort to get some veggies in at breakfast, because even if there isn’t any the rest of the day, I can count that. When the flavours and ingredients are as simple as this, you want to use the best quality possible, so all the flavours shine through. We always use organic free range eggs as not only is it important to us ethically, but they taste so much better too, not to mention they photograph better. We use fresh and ripe tomatoes with different colours, also important when it comes to photographing. But what pulls this whole recipe together is the tomato puree on the base and of course that has to be Cirio. I have honestly never tasted a tomato puree like it and it makes me wonder what kind of tomato puree I had been using all those years previously, which didn’t actually taste like tomatoes. Cirio tomato puree has such a strong tomato taste, because it is double concentrate, which means you can use less and a tube will go further – that means it is money saving too, and we all like that! Tomato puree is such a staple in so many recipes, especially from this blog, try using Cirio to add extra tomatoey flavour to your meals. You can really go wild with this recipe and adapt it as much as you want. Bacon or smoked salmon would go really well on it, you could add some peppers and mushrooms, and you could even mix some sundried tomato paste in with the tomato puree to put on the base – that is recommended. Who says that you can't have pizza for breakfast? This Spinach and Tomato Breakfast Flatbread will feel like eating pizza, but it's still packed full of protein with a vegetable boost too. Now, that's the best way to start the day! Spread the Cirio tomato puree over the flatbread and scatter the spinach on top. Put in a preheated oven at 200C for 10 minutes, until the eggs are set. This looks absolutely incredible. Exactly the way I want my eggs done from now on! On top of a pizza! Seriously mouth-watering! Love the look of this Dannii. I obviously need to start looking after myself a bit more at breakfast time. Yum is all I can say. This looks absolutely delicious and definitely something I’m going to try! Have a fab time in Greece! I’ve just sent this link to my hubby. We’ve got a real thing for spinach at the mo and this looks well nice! I wish I had this for breakfast! The colors are gorgeous and I love all the fresh ingredients! Looks absolutely fantastic, Dannii! This sounds lovely! very very summery! Like makes me wantto travel spain! This looks absolutely amazing. Such lovely flavours. Though I confess I’d prefer it for brunch or lunch as I struggle with breakfasts.